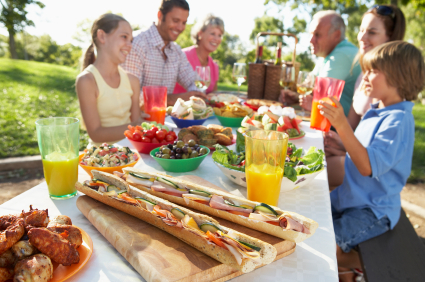 When was the last time you had dinner with your family? If you’re like our family, everyone is always so busy and it’s the meal that we don’t have together often enough because of Ray’s 24 hour work shifts and other hectic activities. But dinners together can actually draw your family closer together! Family dinners are more than just a good, hot meal. It’s about the only time that families have to share time through the week. Whether you sit down to the dinner table eating home-cooked, potato-leek soup, or pizza night takeout, the important thing is that you are together. Research shows that teens who spend dinner time eating with their family are less likely to get involved in drugs, alcohol or other dangerous or immoral activities. Out of all of the things you do to try to keep your kids away from bad influences, the one thing that is the greatest influence is still the event that we often skip! How could dinner together make a difference and why is it so important? For one thing, it’s a time to share your thoughts and feelings. Please DON’T wolf down a cheeseburger in the car driving places, or watch t.v., mindlessly eating your spaghetti while your kid’s in the other room eating his! (I don’t ever watch t.v., eating or not eating!) Take the time to sit down, eat together, really taste and enjoy the food, and talk! If you have never really done this, start today to make this a priority in your family. Kids are influenced by friends, social media, the internet, and the outside world. Through eating dinner together, they get a chance to talk and to connect with their parents on issues like schoolwork, peer pressure, the intriguing or the frightening news, and other things. Your listening ear ministers to their souls. They also learn from your conversation with your spouse. They don’t want your advice or suggestions as much as they want to know that you are interested in their lives and that you love them. They want your TIME and your undivided ATTENTION. You can also share about work, your friendships, finances, your family stories, the news, or other trivia with your kids. Several years ago, I created a “thought of the day” and also wrote down scriptures onto tiny pieces of paper, and put them inside a jar that Ray had bought when he was on one of his mission trips to Haiti. At mealtime, everyone would pull out a piece of paper and see what today’s scripture or thought of the day was. These were sometimes fragments from a poem, a positive affirmation, an amusing joke, or a verse from the Bible. Interestingly enough, everyone actually enjoyed this activity. It often triggered ideas, and opened up conversation. If you are short on ideas, read and learn good books and the news so that you can offer something interesting “to chew on” to your husband and kids! The main point is that conversation is taking place. The average parent talks to their child less than 40 minutes a week! Saying “hi” in the morning or at night, or “do your lessons” if you’re homeschooling your children, isn’t effective communication. When you eat together, you spend at least 20 minutes to an hour there, talking about anything that may be on your minds…hopefully, you are LISTENING more than talking so that your kids can share their hearts! For teen girls, body image is everything. Learning to prepare, cook, and eat healthy meals with their families keeps their bodies in shape and helps to avoid eating disorders like anorexia, bulemia, eating junk food, or overeating. Teen girls are more likely to develop a healthy view of food and their bodies when they eat good, home-cooked meals together with their families.